July is here. For seasonal park employees these are challenging times. We’ve been in our new surroundings for almost two months and the novelty of living in a national park is wearing off and reality starts to set in. And so do the crowds. Fourth of July weekend ushers in the masses — screaming infants, spoiled brat teenagers and impatient parents. The height of summer is indeed “family time” for better or worse. The good news is Going-To-The-Sun Road is open — two weeks late – but open nevertheless. The frustration, disappointment and anger I absorbed from tourists in the days leading up to the road’s opening more than justified my salary. A late season snow storm delayed the road’s projected opening, leaving our tour bus operations in a mad scramble to find alternative routing, while appeasing those who were expecting a magnificent ride over the pass. The snow storm came just when David — God bless him — had completed his nearly 3,000-mile trek to deliver me my Jeep. David’s devotion continues to amaze me. This latest act clearly demonstrates his commitment to our partnership. 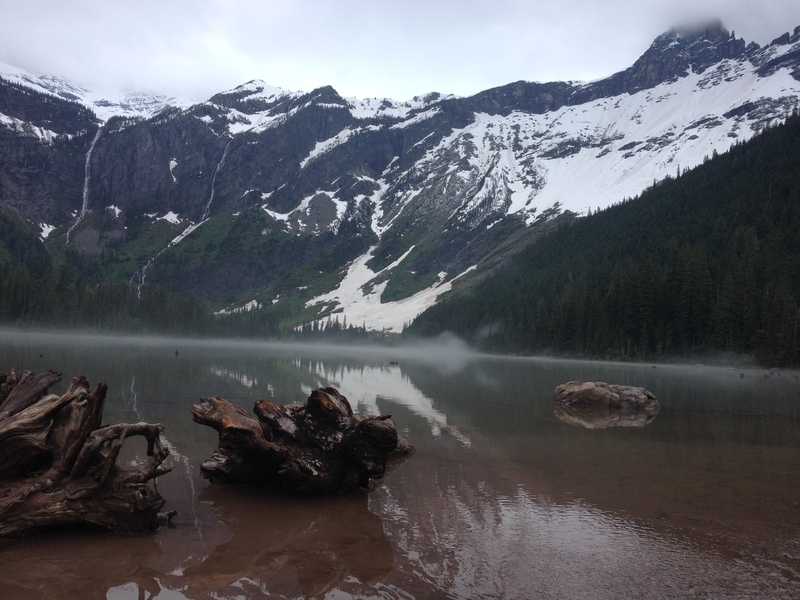 During his visit we hiked to Avalanche Lake, one of the more popular trails on the west side of Glacier National Park. The trail was very muddy that day, it pretty much rains the entire month of June here and the park’s Lake McDonald Valley is considered a Pacific Northwest rain forest. But we persevered, sloshing through the trees while marveling at the size and beauty of the cedars, black cottonwoods and western hemlocks. We discussed many subjects on the hike. That’s one of the great things about hiking with a friend. You really get to know each other better as you both march toward an end goal. I told David how surprised I was at my ability to manage the stress of this new job, particularly with the amount of patience I was exhibiting. Things or situations in the past that were frustrating or caused anger did not seem to have the same affect on me now. Could it be, I wondered aloud, that life’s experiences coupled with the hardships and trauma of the last six years had instilled a coping mechanism that is enabling me to deal with all of the daily troubles and problems. A lost purse, a blown tire, a missed reservation — all in a day’s work behind the concierge desk. A train running late, an allergic reaction to a bug bite, directions to the nearest location with cell phone service ??? … No problem, I have the answers. One of our drivers has said I have “nerves of steel” while another declared I have the biblical “patience of Job.” Flattering comments I will more than accept after the harsh reactions to our no refund policy when the road was closed. Meanwhile, the hike to Avalanche Lake was certainly the bright spot of David’s visit. He’s back in South Florida now and I, for the first time in my National Park tenure, have my own transportation. I usually load up the Jeep after work most days and escape into the park, looking for that quiet spot to rest my mind and write. Glacier is indeed beautiful, snow capped peaks atop rugged Matterhorn-like mountain ranges surround you with the Going-To-The-Sun Road cutting a path through the heart of the park. The scenary along the road is breathtaking and I understand now why the demand to open it was so great. It is an engineering achievement of the highest order. Man’s crowning conquest atop God’s spectacular creation. As I look to build upon my experience here I must acknowledge the last two months have been incredibly hard and the next hard choice I make is whether I should stick it out with no promises that it will get any easier. Perhaps this is where my road to recovery ends. Knowing when to make the right decision. I am so proud of your willingness to take on challenges and the heart you bring to the task. Your God given talents for communicating with feeling and depth is truly profound. You are amazing just the way you are. John’s latest Blog from the north line.